Even if you take care to keep dirt away from your drain cleaner and spray wand coupling ends before you connect them together, over many uses the sediments and mineral deposits in your water can create build-up in the jet nozzle orifices. If this happens you may notice your pressure washer start to unload intermittently when running your jetter hose, as though the spray wand trigger is being continuously released and squeezed. Be aware that most nozzle cleaning tools you’ll find online aren’t made to fit through the tiny orifices of a drain cleaner jet nozzle. Unless the tool is advertised as specially-made for sewer jet nozzles, it may be too big. 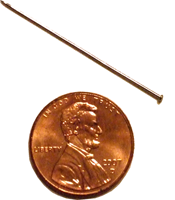 To solve the problem, look for the tiniest straight pin in your household sewing drawer. This is the type of pin that’s often found in new packages of shirts and other clothing. The pin should be small enough to slide into the sewer jetter nozzle orifices without forcing it. Detach the jetter hose from the pressure washer, then use the pin to gently clean any clogged orifices, taking care not to force it into too small an opening. Reattach the jetter hose to the pressure washer and check to ensure that the hose is now working normally. It may take two or three gentle cleaning attempts to completely remove all the built-up sediment. For more sewer jetter care and maintenance tips, watch the Clog Hog drain cleaner instruction video. Got questions or comments? Email us.